Singapore's younger adults rank highly in numeracy, literacy and problem-solving skills, a major international study has found, but the older generation lags considerably behind. While this reflects the progress in education and training over the decades here, this "skills gap" also highlights that more needs to be done to upgrade the skills of older workers, said experts. The study of 34 economies by the Organisation for Economic Cooperation and Development, which included Singapore for the first time, also linked higher skill levels to better wages here, another reason for older workers to keep improving themselves. Still, employers place more premium on qualifications, and a better balance should be found, believes OECD director for education and skills Andreas Schleicher. The results of OECD's Programme for the International Assessment of Adult Competencies (Piaac), which also involved countries such as Australia, Japan and South Korea, were released yesterday. Those aged between 16 and 34 in Singapore ranked second behind the Finns in problem-solving using digital tools, fifth in numeracy, which was also topped by Finland, and ninth in literacy, which was led by Japan. But older adults here aged 45 to 65 performed lower than the OECD average. They were ranked 31st in literacy and numeracy skills and 18th for problem-solving. The difference in scores between the younger and older generation here is also among the widest when compared with other countries. One reason for the gap, OECD said, could be the survey being conducted in English here. Almost eight in 10 respondents aged above 35 here said they were not native speakers. Mr Ng Cher Pong, chief executive of the Singapore Workforce Development Agency, believes the difference reflects the marked improvement in Singapore's education and training systems over the last 50 years - including the ramp-up in schools and programmes. 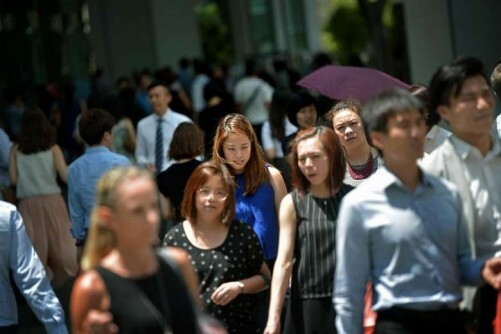 But it is "hugely important" that Singapore finds ways to upgrade the skills of older workers, such as through schemes like SkillsFuture, said Dr Schleicher. SkillsFuture is a national initiative to equip workers with skills. Doing so could "dramatically raise" Singapore's productivity and keep them employable, he said. He highlighted how the survey, which involved 5,468 citizens and permanent residents, found that wage levels here were strongly linked to skill and education levels. An increase of about 48 points in literacy proficiency scores is linked to a 12 per cent increase in hourly wages, almost double the OECD average. About 3.2 extra years in education bring a more than 30 per cent rise in wages - more than double the OECD average. "Singapore employers pay quite a lot of attention to formal qualifications," said Dr Schleicher. But this might not be a good indicator of one's proficiency. "It's the use of skills that drives productivity, not years of education," he added.